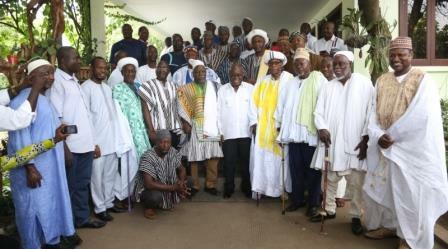 Kuga Na Abdulai Adam II has called on the Dagbon Traditional Council to review the 1930 Constitution of Dagbon Kingship that deals with Traditional Customs of the Dagbon Kingship. He said, although some parts of the constitution were amended some years ago, other parts still needed to be reviewed. Kuga-Na Adam II made the call when the members of the Yendi Peace Committee paid a courtesy call on him at his Palace at Kuga in Yendi to congratulate him on the enskinment of the new Ya-Na. He said for instance that, the constitution should ensure that, the funerals of Ya-Nas should be performed within one year when they die, while those of the Paramount Chiefs, Divisional Chiefs, Sub-Chiefs and chiefs should be performed within six months when they die. He said because the constitution was not duly adhered to, Regents were now compelled to occupy the skins for more than one year. Kuga-Na Adam II who is one of the kingmakers of the Dagbon Kingship said if a Ya-Na died and his funeral was performed, contestants, were the sons of the Ya-Na, occupying the skins of Mion, Savelugu and Karaga and not the grandsons of the Ya-Na. He said the delay of such funerals brought about confusion, rumours, speculations and conflict. He commended President Nana Addo Dankwa Akufo-Addo, the Eminent Chiefs led by Otumfuo Osei Tutu II, King of Ashanti Kingdom, Nayiri, Naa Bohugu Abdulai Mahami Sheriga, Overlord of Mamprugu and the Yagbonwura, Tutumba Boresa Sulemana Jakpa Overlord of the Gonja Kingdom and all those who made the enskinment of the new Na-Na successful. He called on the politicians to abstain from Dagbon Chieftaincy issues as the differences brought about numerous divisions and said the next the task ahead of Dagbon was for the Regents to perform the funerals of their late fathers for new chiefs to be enskinned for Traditional Councils to be reconstituted for sitting to start. He mentioned that, Mion, Savelugu, Karaga, Tolon, Naton, Yelzoli, Kworli, Kuyuli, Sheini, Zoosali, and Saakpuli are areas where funerals of late chiefs of Dagbon were pending. The rest were ; Chereponi, Tibung, Zangalina including; others where funerals of chiefs were to be performed within Dagbon Traditional Council. The Kuga Na appealed to the Government to rehabilitate the Dagbon Traditional Council Building which was now in deplorable state. Bishop Vincent Sowah Boi-Nai the Bishop of Yendi, Patron of the Yendi Peace Committee expressed their appreciation to the Kuga-Na for the enskinment of a new Ya-Na. He reiterated the need for record keeping and documentation of Dagbon Kingship for the future generation, which would help to avoid chieftaincy conflict and assured the Kuga –Na that Yendi Peace Committee would continue to work with custodians of the Dagbon kingship in promoting peace. Mr Peter Atia the Secretary of the Yendi Peace Centre said since 1994, the centre organised 148 workshops, meetings, seminars, fora, village to village meetings for the Chiefs, Youth, Women Groups, Imams including; others on peace building. Mr Atia urged all stakeholders to respect early warning signals to avoid any future conflict. The Ghana news Agency (GNA) was established on March 5, 1957, i.e. on the eve of Ghana's independence and charged with the "dissemination of truthful unbiased news". It was the first news agency to be established in Sub-Saharan Africa. GNA was part of a comprehensive communication policy that sought to harness the information arm of the state to build a viable, united and cohesive nation-state. GNA has therefore been operating in the unique role of mobilizing the citizens for nation building, economic and social development, national unity and integration.